NEW YORK Angelina Jolie paid glowing tribute on Thursday to the Pakistani teenager who was shot by the Taliban for advocating for girls' education, telling the girl's story to a high-profile women's conference and committing $200,000 to a new fund to promote her cause. "Today I'm going to announce the happiest moment of my life," the teenager said in the brief video, wearing a bright red headscarf and at one point shyly covering her face with her hands. She said that a new school in her homeland would be built, for 40 girls aged 5-12. "Let us turn the education of 40 girls into 40 million girls," she said. Malala said the Malala fund would issue a $45,000 grant - its first - to back girls' education in Pakistan. The fund said it wasn't announcing the school's location due to security concerns. Malala has garnered huge global attention since she was shot in the head in October by Taliban attackers angered by her activism. She was brought to Britain for treatment, including skull reconstruction and cochlear implant surgeries. She is now attending school there. She recently signed a deal to write her memoir, and was also shortlisted for Time Magazine's "Person of the Year" in 2012. Jolie gave an emotional rendition of her story. 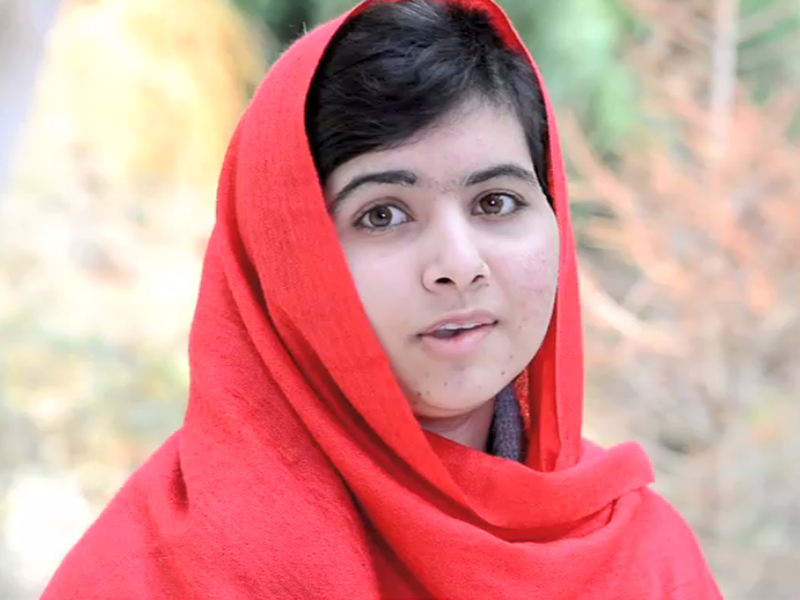 "Here's what they accomplished," she said of Malala's attackers. "They shot her point blank range in the head -- and made her stronger. The brutal attempt to silence her voice made it stronger." Jolie was not the only Hollywood star on the stage at the conference. Meryl Streep was there to honor another activist, Inez McCormack of Northern Ireland, who died in January of cancer. At the first Women in the World summit three years ago, Streep had played McCormack in a short play, called "Seven," with McCormack herself watching from the audience. Streep spoke some lines from the play on Thursday evening -- in a flawless Irish accent. Jolie, who is a special envoy for the U.N. refugee agency, told an anecdote about Malala that had the audience smiling. She said the girl's father had shown his daughter, in the hospital, a poll that said she was the sixth most influential person in the world, and that President Obama was seventh. But the girl, according to the story, said she wasn't so happy with that -- she didn't think people should be categorized like that.